The new FLCH-6S: FriconUSA Large-Sized Chiller, 6 Series Standard, air cooled condenser, is designed to meet most of the demands of medium to large range capacity for air conditioning. The quality, high efficiency and low cost of this product, offers an excellent alternative in the market. The most common applications are for air conditioning in large-sized buildings such as offices, schools, hotels, shopping centers, and supermarkets amongst others. Extended ambient operating temperature range: +125°F (+51.7°C) to -20°F (-28.9°C). Uneven tandem Bitzer scroll compressor for better capacity control in most cases. Aluminum frame with galvanized steel reinforcement, high efficiency condenser with strong structure and micro-channel coil aluminum, less weight and size; reduces transport, assembly and construction costs. Eco-Friendly; Air cooled Micro-channel condenser coil with reduced internal volume requires between 40% to 60% less refrigerant charge and results in a significant reduction of the charge necessary for normal or flooded operations. 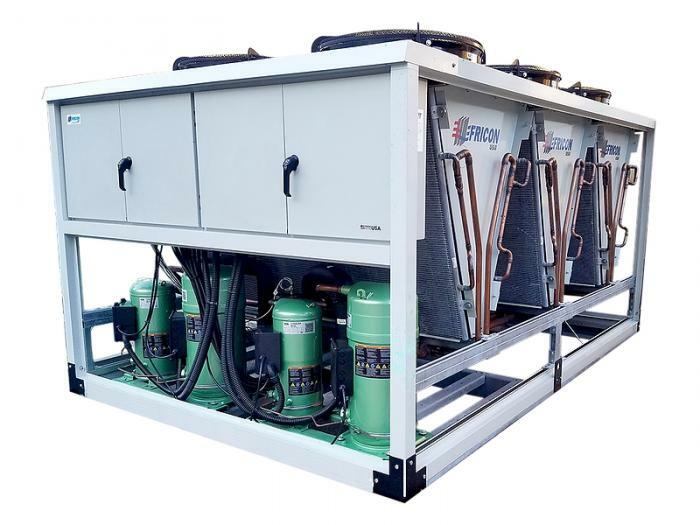 Built-in, Direct Expansion (DX) brazed plate evaporator, single or dual circuit according to the model, with reduced internal volume requires less refrigerant charge. Liquid drier with replaceable core and inlet ball valve. Flexible joint on discharge line. Factory pre-charged and individually tested. Compressor and fans circuit breakers.